Sterling, Christopher H., and Michael C. Keith. 2006. The Museum of Broadcast Communications Encyclopedia of radio. New York: Fitzroy Dearborn. I ordered this 3 volume set and guess what? The library pages could not find it. This was a very common occurrence when I worked at NYPL, so I wasn't annoyed and ordered something else. Howarth, Ian. 2017. Rock 'n' radio: when DJs and rock music ruled the airwaves. Howarth is a Canadian so the book discussed how top 40 radio developed in Montreal in the 1960s. He discussed radio stations CFCF and CKGM featuring DJs Dave Boxer and Buddy Gee. Havers, Richard. 2017. Rolling Stones, on air in the sixties: TV and radio history as it happened. It was a coffee table book that featured many photos of the Rolling Stones in their early years. I was amused by seeing several photos of the Stones wearing the same clothes as they performed on TV. Later in their career, they dressed in different outfits. After that, I went downstairs I viewed an exhibit that honored Leonard Bernstein on the 100th anniversary of his birth. It offered a comprehensive retrospective of his life and career in classical music. It included over 150 photographs, personal items, papers, scores, correspondence, and costumes. From there I perused through the circulating library. I didn't want to take out any books since I would likely have to make a special trip to Manhattan to return them. 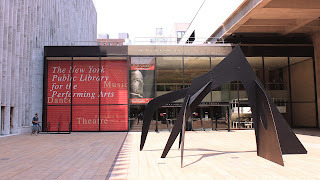 I certainly enjoyed my day at the Performing Arts Library and will definitely make a return visit.